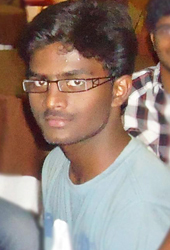 Currently pursuing b.tech final year specialized in mechanical engineering at NIT warangal. I am interested in film making from a long period of time and my wish came true with my first short film - Time Scape (a romantic thriller based on concept of time travel) with the help of my crew. Timescape was self written,edited and directed by me. I am having knowledge of photoshop,adobe after effects, adobe premiere pro and bit of knowledge on autodesk maya.